No war memorial was erected in Markfield after the First or Second World Wars. Instead, after WWI, the villagers raised funds for what became the Memorial and Miners' Welfare Institute. Hoewever, each Church has its own list of names of men who died in or as a result of wars. The Parish Church, St Michael's, also records men who served but were not killed. This page shows the names of Markfield men who died in World War One and are inscribed on the 2014 War Memorial by St Michael's Church. As explained on the War Memorial page, these names were selected by the local history group. 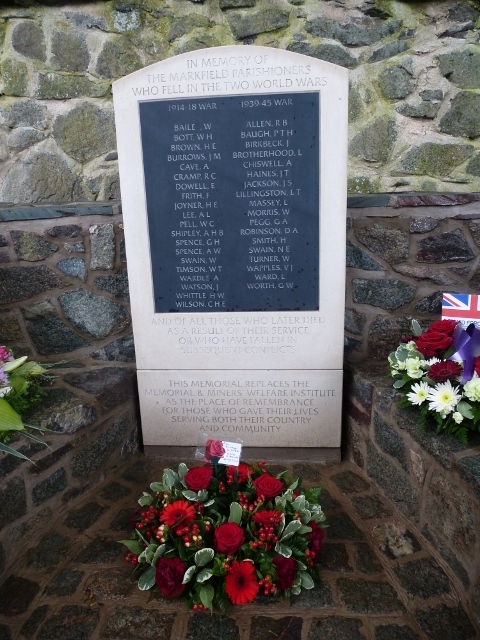 The men whose names are shown on the war memorial are W Bailey, WH Bott, HE Brown, JM Burrows, A Cave, RC Cramp, E Dowell, F Frith, HE Joyner, AL Lee, WC Pell, AHB Shipley, GH Spence, AW Spence, W Swain, WT Timson, A Wardle, J Watson, HW Whittle and CHE Wilson. Details of each man, largely drawn from records accessible to the public, are being added below. The available records vary significantly from person to person, so more information has been found for some men than others. He was born in 1894 and baptised on 7th March in Markfield, the son of William (a well sinker and quarryman) and Emma Bailey (nee Hughes). He was brought up in Main Street. By the age of 17 he had left home and moved to Field Head where he lived with John Walton (farmer) and was the under Cowman. He had 10 siblings. Walter signed up in Coalville, as a Private in the Royal Leicestershire Regiment. Later he transferred to the Northumberland Fusiliers, and then to the 5th Battalion, King’s Own Yorkshire Light Infantry. He died on 1st October 1918 of wounds while fighting near Grevillers/Bapaume in Pas de Calais, France. He was not married. The register of soldiers' effects shows that he had credits of £7 7s 6d, which was paid to his father in April 1919. In December 1919, his father received a war gratuity of a further £8 10s 0d. The war gratuity was introduced in December 1918 as a payment to be made to those men who had served in WW1 for a period of 6 months or more home service, or for any length of service overseas. Private Bailey is buried/commemorated at the Grevillers British Cemetery, by a Memorial Plaque and window in St Michael's Church, and also on the Roll of Honour on the Organ (but not shown as having died). His brother, Lewis Bailey, also fought in WW1 and possibly died. He was born in Markfield in the first quarter of 1891 and brought up in Hill Side. His parents were William Bott (a shoemaker) and Mary (nee Widdowson). He had 7 siblings. At the age of 18, in 1909, he enrolled as a sapper with the Royal Engineers. In November 1914 he received a gunshot wound in the right leg while fighting in Armentieres, France. He was paralysed from the knee down. He returned home and was discharged from the army in December 1915. He continued to have regular medical reviews. In September 1918 he was diagnosed with tuberculosis (TB) from which he died on 15th November 1918. The army medical report said the TB was not attributable to his army history. He did not marry. His father received a war gratuity of £7 10s in 1920, his earlier death being noted on the records. He is buried/commemorated in Markfield Cemetery and by a Memorial Plaque and window in St Michael's. H Bott is included on the Roll of Honour on the Organ in St Michael's, but it is not clear that this is William Harold Bott, as he is not shown as having died. His brother Simeon Smith Stanley Bott was born in 1895. He enrolled in September 1914 as a saddler in the Royal Field Artillery. He sailed to France in July 1915 and returned to Markfield uninjured in June 1919. He was born in 1897 and baptised on 12th July, in Markfield. His parents were Edward Brown (coal miner, later a blocker at the quarry) and Sarah Elizabeth (nee Mee). He had 8 siblings. Harry was brought up in Main Street, Hollywell Lane and Ashby Road. By the age of 13, he was a farm labourer. He enlisted in Coalville, Sapper 196331 with the Royal Engineers, later with the 198th Quarrying Company. Sapper Brown died on 24th November 1917. He is buried/commemorated in Les Baraques Military Cemetery, Sangatte, Calais, by a memorial plaque and window in St Michael's, Markfield, and on the Roll of Honour on the Organ. He did not marry. The Coalville Times on Friday November 30th, 1917 reported that Mr and Mrs Edward Brown, Council Houses, Markfield, learnt that their son was accidentally killed last week. He had just returned from a fortnight’s leave. On Friday February 1st, 1918, the paper reported under 'local chit chat' that he met with an accident while working in a quarry in France, and died two days afterwards. He was laid to rest in an adjoining cemetery, being accorded full military honours. Lieutenant Preston, conveying the sad news to his parents, spoke of him as a willing worker, a smart soldier, and one who undoubtedly would have gained promotion. He had been at the quarry for 16 months, and previous to joining up worked for the Cliffe Hill Granite Company, Markfield. He was born about 1890 /1891. His birth records are not clear; the 1911 census records he was born in Markfield. He became a coal miner and by 1911 he was living in Thornton Road, Markfield. He married Mary Louisa Tarry in 1911 and they had four children: Edward James (b1911) and Clara Louisa (b1914), Beatrice M (b1915), Ida Isabel (b1918 aka Bella). When he married, he was living in Melbourne Road, Ibstock. He enlisted in Leicester, Private 48177 with the 1st Battalion, Leicester Regiment. His wife was living in Main Street, Markfield. Private Burrows died of wounds in the 11 Stationary Hospital, Rouen, France on 2nd October 1918. He is buried / commemorated at St Sever Cemetery Extension, Rouen. There is a headstone in Markfield Cemetery, a memorial plaque and window in St Michael's, and also on the Roll of Honour on the Organ. He was born in 1894 (Quarter 3, baptised 8th October in Markfield - although Ancestry military records show him as born in Wakefield). His parents were Thomas Cave (Knocker Up at Quarry) and Elizabeth (nee Clapham). His siblings wereThomas William (b 1889), Walter (b 1891) and Hilda Annie (b 1899). Albert was brought up in Main Street and Thornton Road, Markfield. He became a driller at the quarry. He did not marry. He enlisted in Coalville, Private 18675 with the 1st Battalion,Grenadier Guards. Private Cave was killed in action on 26th September 1916. The Coalville Times on Friday 20th October, 1916 reported that his parents had been notified that he was killed in action, that prior to the outbreak of war, he worked at the Cliff Hill Quarries and that he was a prominent local footballer and cricketer. He is buried/commemorated at the Thiepval Memorial, on a memorial plaque and window in St Michael's, and the Roll of Honour on the organ. He was born in Markfield in 1886, the son of Karen Jane Cramp. He was brought up in Main Street by his widowed grandmother, Thirza (one of a number of spellings) Cramp. His mother worked in Leicester, where she married Walter Read in 1892. Reginald then came to have four half siblings. In 1900, his grandmother died. In 1901, he and his uncle John Cramp were boarders at a house in Main Street, where he probably lived until 1905. Aged 14 in 1901, he was a coal miner. It appears that he never lived with his mother. In 1905, whilst still working as a collier, he signed up with the 2nd Batallion of the Leicestershire Regiment. In 1906, he was posted to India for 7 years. His military records show that he had various spells in hospital. Upon the conclusion of his army service, he transferred to the reserves and returned to England in 1913. In March 1914, he married Alice Clapham in Leicester and they had two children. He was recalled to the army and posted to France in September 1914. His family went to live in Aylestone Park in Leicester. Private Cramp was killed in action near Ypres in Belgium on 21st December 1915, aged 29. He is commemorated at the White House Cemetery, St Jean-Les-Ypres in Belgium. Read an account of the days leading up to his death. He enlisted with the 2nd Battalion of the Leicestershire Regiment. Private Dowell was killed in action on 17th August 1915, aged 34, and is buried in a military cemetery at Laventie near Armentieres in Northern France. According to the Coalville Times (Friday 10th September), Mrs Dowell received a letter on Friday morning informing her that her husband had been killed while performing his postal duties “somewhere in France” on Tuesday afternoon. Photographs of his wife and four children, received that morning, were found in his pocket. Pte. Dowell was for some years at Markfield, and was very much respected. On the afternoon of Sunday, 19th September 1915, a muffled peal was rung on the bells of St Michael's Church in his memory. He was born in Whitwick in 1892. The family soon moved to Shepshed, and by 1901 had moved to Markfield. His mother died in 1908. By 1911 he had moved to Battle Flats, Bardon, with his father and brother Charles. He was working, like his father, as a carter. Later in 1911 his father remarried to Martha Elizabeth Gardener and they moved to Cliffe Farm, Markfield. In 1915 his occupation was waggoner. He did not marry. He enlisted in December 1915 in Loughborough, with the 6th Battalion, Leicestershire Regiment and was mobilised in January 1916. Private Frith was killed in action on 27th May 1918 in France when the Germans mounted an overwhelming attack on the allied positions near the river Aisne, pushing the allies back across the Aisne to the Marne. Read an account of that fateful day. He is commemorated at the Soissons Memorial, with no known grave, on a memorial plaque and window in St Michael's Church, and also the Roll of Honour on the organ. He was born in 1878 in Birmingham, and brought up by his mother in West Bromwich. He was baptised twice in the same parish, in 1878 and then again in 1880! The 1911 census records him as living in Handsworth, Staffordshire, working as a baker. He joined the Royal Warwickshire Regiment. Private Joyner was killed in action on 1st April 1917, in France and Flanders. He is buried in Epehy Wood Farm Cemetery. His residence was recorded as Handsworth. E Joyner is included amongst the name of those remembered during the Act of Homage at St Michael's Church. His link to Markfield appears to be that his brother Thomas Joyner was the Church Warden at the time of the war. Born in 1894 in Ellistown, his parents were George Jordan Lee (Colliery Clerk) and Mary Ann (nee Coleman). His first couple of years were spent in Ellistown. His father died when he was 5 years old. He is next recorded living in Blaby with his uncle and aunt and his mother and brother. In 1906 his mother married William Morcombe, the butler to the Lillingstons at Ulverscroft. His mother moved to Ulverscroft as cook to the Lillingstons, but he and his brother stayed with their uncle and aunt in Blaby. He became an apprentice joiner in Blaby. He enlisted in Leicester with the 15th Field Company, Royal Engineers. Sapper Lee died on 3rd January 1916, near Versaille in France, probably as a result of wounds as the cemetery in which he is buried was a hospital cemetery. He did not marry. He is buried/commemorated at Les Gonards Cemetery, Versaille. He is listed on the Roll of Honour on the Organ in St Michael's. He was born on 21st December 1879 in Great Staughton, Huntingdonshire. His parents were Charles Pell (agricultural labourer) and Eliza (nee Cowley). He had a half sister, Louisa Mayes (b 1886). He was brought up in Great Staughton. His father died when he was 4 years old. His mother remarried to John Mayes in 1885 and the following year gave birth to his half sister. By the age of 11 he was working as an agricultural labourer. His mother died when he was 14 and he went to live with his grandfather, James Pell, in Great Staughton. By the age of 21 (1900) he was a domestic gardener. In 1910 he was recommended to Mrs Lillingston (by her brother) for the job of gardener at Ulverscroft and went to live in “The Gardens”, Ulverscroft. He married Emily Elizabeth Hackett in 1910, just before moving to Ulverscroft. She continued to live there until her death in 1963. They had two children Stanley William Pell (b 1911) and Gladys Emily (b 1912). He enlisted in Coalville, Gunner 122707, 278th Siege Battery, Royal Garrison Artillery. Gunner Pell died of wounds near Ypres, Belgium on 5th July 1917. He is buried/commemorated at La Clytte Military Cemetery, near Ypres, on a memorial plaque & window, St Michael’s Markfield and on the Roll of Honour on the organ. The Coalville Times of Friday August 10th, 1917 reported that Mrs Pell, of Markfield, is informed that her husband, Gunner W. Pell (35) R.G.A. was killed in action on July 5th. He was formerly employed in The Gardens, Ulverscroft, and was of great assistance to the local Horticultural Society. On Sunday evening a memorial service was held at the Parish Church, where he had been a valued member of the choir. He leaves two young children. He was born in 1895 (3rd quarter) in Ledbury, Herefordshire. His parents were Arthur Granville Shipley (C of E Clergyman) and Caroline Mary Ellen (nee Butler). They married in St Michael’s Markfield, where Caroline’s father had previously been Rector - Caroline was recorded as living with her widowed father and siblings on Main Street in Markfield in the 1881 census. He had no siblings and did not marry. In his early life, he moved to Yorkshire with his parents (by the time he was 5 years old) and is recorded at boarding school in Haily House, Hertfordshire aged 15. When he died, his parents were at All Saint's Vicarage, Pontefract. In the army, he was a 2nd Lieutenant, Yorkshire Regiment, “A” company, 6th battalion. He fought in Egypt in 1915, and was injured (presumably from fighting at Gallipoli); in August 1916 he was in France and Flanders; and on 27 September 1916 the regimental diary records that he was killed at 11.20 pm at the Somme. 2nd Lieutenant Shipley was killed 27th September 1916 in the Somme area. He is buried/commemorated at the Thiepval Memorial. He is listed on the Names of Those Remembered During the Act of Homage at St Michael's, Markfield. There is no evidence that he had any direct relationship to Markfield, other than his father having previously been Rector. Born in Markfield in 1891, he was the youngest of the nine children of Matthew Edward and Eliza, and was known as Harry. His father was a baker who ran the Co-op on Main Street for many years. By the 1901 census, the family had moved next door into the George Inn (where the Co-op is now). His father was the publican for a short time before retiring. In the 1911 census, George was living in Alma Villa on London Road, with his parents and one of his brothers. He was a coal porter, although out of work. In 1912, his mother Eliza died. He did not marry. Soon after the war started in 1914, he signed up with the Leicester Yeomanry. Private Spence was killed in action on 13th May 1915, aged 23. The Yeomanry were holding trenches on the Menin-Ypres road in Belgium, when there was a violent attack by the Germans. The Yeomanry had to retire (withdraw), but later mounted a furious attack to regain their positions. This was the most significant battle of the war for the Yeomanry. In Harry's squadron of 78 men, only 8 survived. Read more of the battle. He is remembered at the West-Vlaanderen Ypres (Menin Gate) Memorial. On Saturday May 22nd 1915 The Leicester Chronicle and Leicestershire Mercury published under the heading. “LEICESTERSHIRE YEOMANRY.” – THE CASUALTIES. – Mr. H. E. Spence, of Markfield, yesterday morning received news from the front that his brother, Trooper H. Spence of the Leicestershire Yeomanry was killed in action last Thursday. A comrade, Trooper Simons in a letter says: “I was one of the fortunate eight who returned out of the 78 composing our squadron. It was an awful time, Harry was not by my side, but I learned afterwards that he died a painless death, and was buried later. Trooper Spence was first servant of the late Major Martin. Locally he was well known in sports circles. The Coalville Times on Friday 21st May, 1915 reported that news reached Markfield on Wednesday morning from Lance-Corporal Simons, that Trooper Harry Spence, had fallen with others of the Yeomanry, in the recent engagement. Trooper Spence joined the Yeomanry early in October and went to the front with the regiment in November. Previous to his journey he had worked for a considerable time at Messrs. Stableford and Co’s Works, at Coalville. He was well known in the Coalville and District league football circle, and was interested in cricket and running. He was highly respected and much sympathy is felt for his father and other relatives. On Friday June 4th, 1915, the paper reported that at the Parish Church, Markfield, Sunday evening, a memorial service was held for Trooper Harry Spence, of C Squadron, Leicestershire Yeomanry, who fell in action on May 13th. On the altar was placed a wreath of laurels. Preaching to a large congregation from the text, “No man hath greater love than that a man lay down his life for his friends,” the Rev. H. Chambers said he considered that service unique inasmuch as he believed it was the first service to be held in that church in memory of one belonging to the village who had died for his country. He thought the people of Leicestershire ought to be proud of the achievements of the regiments belonging to the county. They had made a name for themselves that would live in history. The brave men who had gone forth to fight the organised brutality – more terrible than they at home could imagine – were, in his opinion, fighting for the cause of Christianity, and therefore for the church. Surely then, the people belonging to the church should hold in reverence the memory of those who fell, for dying in a cause so sacred they were as blessed martyrs for their country and faith. While they thought of the one in memory of whom they were holding that service, as a healthy young man, a general favourite of the village, such as they knew him, he would like them to remember him as one who had made the greatest of all sacrifices for his country, that of giving his life; and although his grave may be unknown, save, perhaps, for a small wooden cross, he (the preacher) thought he was buried in a land consecrated by the blood of the thousands who had fallen fighting against the wicked brutality of the enemy. He pleaded with the congregation to remember that our brave soldiers were fighting and giving their lives so that we as a country might live; therefore those at home could not do too much for these brave men. During the service the organist, Mr Dilks, played the ‘Dead March.’ The hymns, “Peace, perfect Peace,” and “Fight the good fight” were sung, and also Psalms 89, 90 and 130. At the close the National Anthem was sung.